The Sukhoi Civil Aircraft Company (SCAC), manufacturer of Russia’s Sukhoi Superjet 100 (SSJ100) regional airliner, suffered 804.7 million ruble (US$12 million) net losses in the first half of 2018, according to the company’s financial report compiled in accordance with Russian accounting standards. The company’s financial performance deteriorated by seven per cent compared to the same period last year, although it received a 47 per cent higher turnover, amounting to 16.007 billion rubles, because of a larger number of deliveries in the first half of the year. Gross profits increased by almost 99 per cent to 2.723 billion rubles, including revenues from aftersales business, which more than doubled to 1.088 billion rubles, as the fleet of SSJ100s in operation grows each year. SCAC’s long-term debt obligations, as of June 30, stood at 27.153 billion rubles, up 55 per cent on December 31, 2017. In contrast, the company’s short-term liabilities decreased by 23 per cent to 58.728 billion rubles. The SSJ100’s global market share of deliveries of regional jet airliners was 13 per cent in the first half of this year, down from the peak 18 per cent registered in 2017. The all-time low since the aircraft’s entry into service in 2012 was reported in 2015, when it was 12 per cent. In the first half of this year SCAC delivered eight units, two more than for the same six-month period of 2017. So far this year (to August 17), five aircraft were delivered to Aeroflot, four to Azimuth Airlines, whilst the Thai Royal Air Force received one aircraft in VIP-configuration, SCAC has revealed to Russian Aviation Insider. 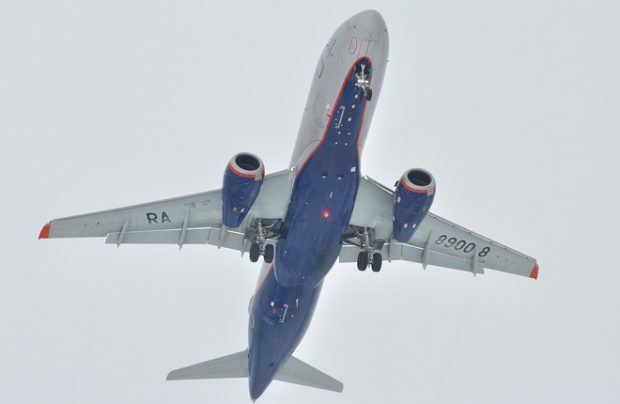 Russia’s United Aircraft Corporation forecasts that global market demand for new aircraft in the SSJ100’s 60-120-seat segment will reach 4,610 units over the next two decades, of which 205 will be satisfied by Russian operators. SCAC’s net losses decreased three-fold last year, to 1.101 billion rubles, as its revenues climbed by 18.4 per cent to 55.368 billion. SCAC president Alexander Rubtsov has told TASS newswire that he does not expect the SSJ100’s break-even point to be reached before 2019 or 2020. To achieve that milestone the original equipment manufacturer would have to produce and sell between 32 and 34 aircraft each year.